It’s come to this: the Democratic Senatorial Campaign Committee (DSCC) is attacking former Sen. Scott Brown for what his campaign says was an innocent reference to when he became eligible to vote, the latest chapter in the “war on women” meme that seems particularly desperate, even for Democrats. It all started during a debate on Monday, when Brown, who’s locked in a tight race with incumbent Democratic Sen. Jeanne Shaheen (D-NH), said he’s supported women getting birth control since he was 18 years old. “To think that I don’t support women’s rights and ability to get contraception is just a false premise. I have since I was 18 years old,” Brown said during the debate. Following the debate, Brown’s campaign told Bloomberg Politics he was “referring to the age U.S. citizens can vote and engage in civic action.” But Democrats, led by senior aides at the DSCC, offered a more sinister interpretation. “What kind of grownup makes clear that everyone knows he was sexually active at 18 when talking about birth control? Scott Brown does,” Barasky tweeted on Monday. 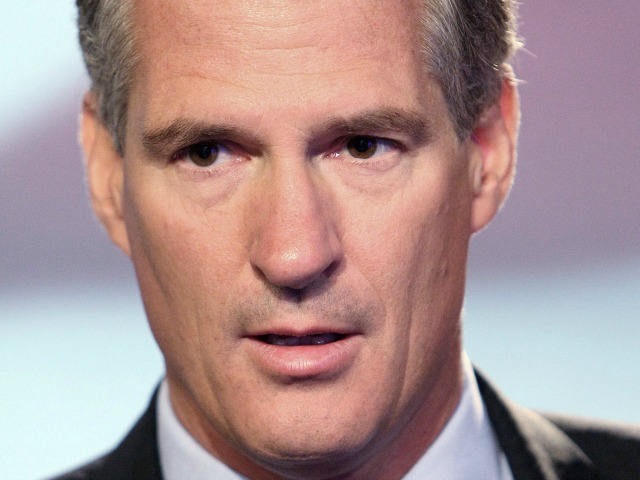 “Scott Brown’s become the creepy guy who can’t stop talking abt what he did in HS. What’s wrong with him?” Barasky added. Liberal media outlets that covered Brown’s remarks in the debate–like TPM and the Huffington Post–did not mention the DSCC’s Barasky’s or EMILY’s List’s McIntosh’s comments about Brown in their pieces. At a press conference before Sen. Marco Rubio (R-FL) endorsed him at a foreign policy themed event in New Hampshire, Brown called on Shaheen to remove from the airwaves a new attack ad that frames Brown as being opposed to women’s healthcare. In a statement, Brown called the ad “despicable” tactics on Shaheen’s part. “Her lies and scare tactics are, quite frankly, disappointing,” he said, demanding she remove the ad–which he says is false–from the air. The bill that Shaheen’s ad was referring to does not use the word “force,” and what local reporters described as a “visibly upset” Brown said, as such, Shaheen “lied” and must remove the ad. “The referring physician, the physician performing the abortion, or either the physician’s agent must provide… color photographs or… realistic drawings of the developing unborn child,” the bill text reads, according to the local media outlet. Brown’s statement attacked the National Democrats for their “scare tactics” in New Hampshire and nationally too.